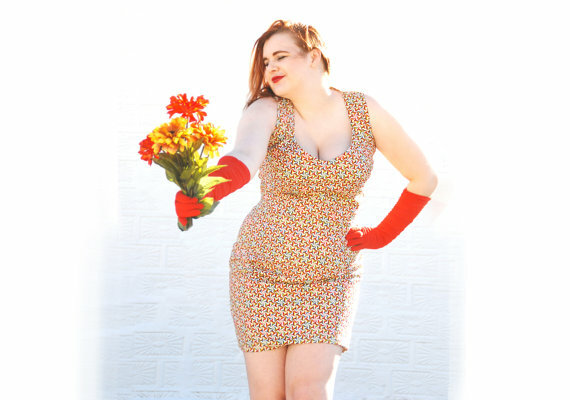 Vintage curvy mini dress – love! You can tell a lot about the shop just looking at this pic. The staging is wonderful – those gloves, the flowers, the model! Click through to see the other views. Kyana, the shop owner, gives you all the information you need to make an informed purchase – and she does it with fabulous, clear, detailed photos. So already I really like this shop – and then, I find fabulous treasures like the dress here. And a coat I would HAVE to buy if it was my size. And a swimsuit to lust for! And, well, there are lot of treasures you will want to uncover. The shop slogan is “vintage apparel with heart” and it shows. Kyana has created a store filled with treasures that you absolutely need to find! Okay, it doesn’t *have* to be a square dance dress. But it’d be so much fun! Isn’t that an adorable dress? I love that it’s fun and flirty – super wearable – and it could go from day to night as easy as, well, “Hey, let’s go out!”. 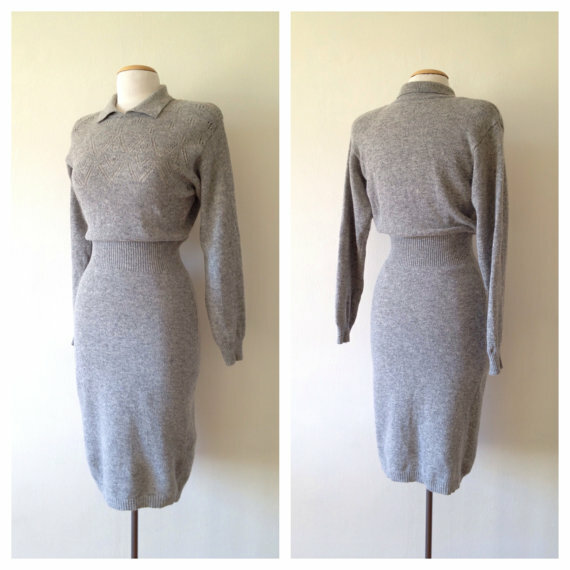 Doesn’t hurt that it’s on sale, either, and that it’s in an extremely adorable-itself-shop: Rax Clothing, a vintage boutique on Etsy where you will find some wonderful deals. The first thing that Gina and Nicole (shop owners) said in their “About” page is “We don’t believe in fashion rules”. So already I’m loving them. Add in the terrific vintage choices, great staging, and general all-around fabulousity, and you are going to love that I pointed you to this shop! 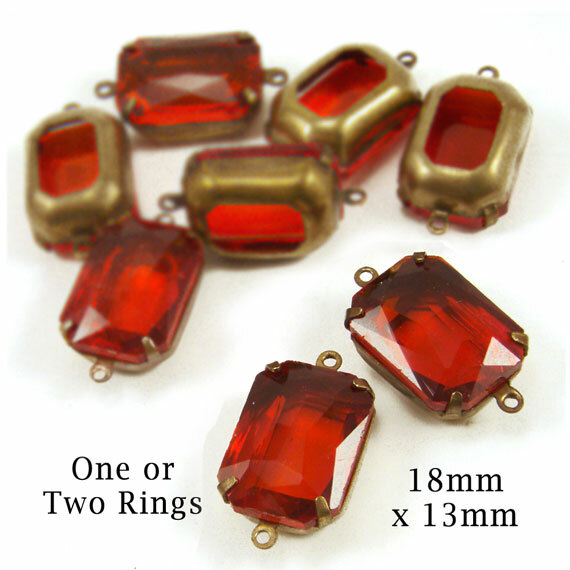 Okay, it’s not hard to find clear glass jewels, even vintage ones. 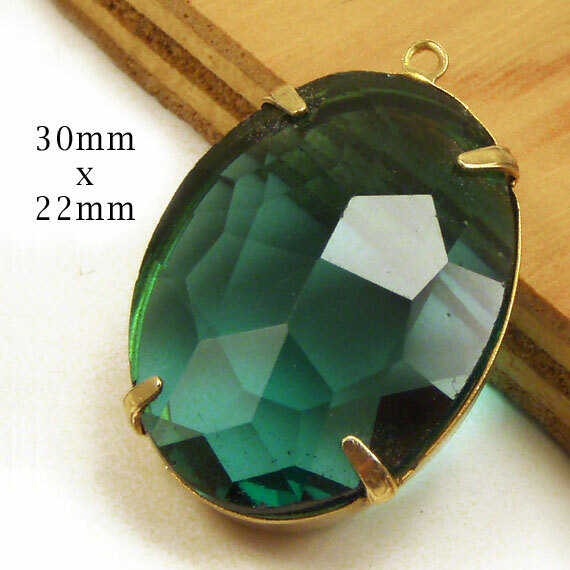 It is hard to find beautifully faceted, quality glass in this wonderful 12mm x 10mm size. They’re just lovely – large enough to have presence, even in clear glass! but petite and delicate, all the same. And the clear glass? You’d think it would sort of disappear – but it doesn’t. It gets a lovely sparkle from the faceting, and the settings. 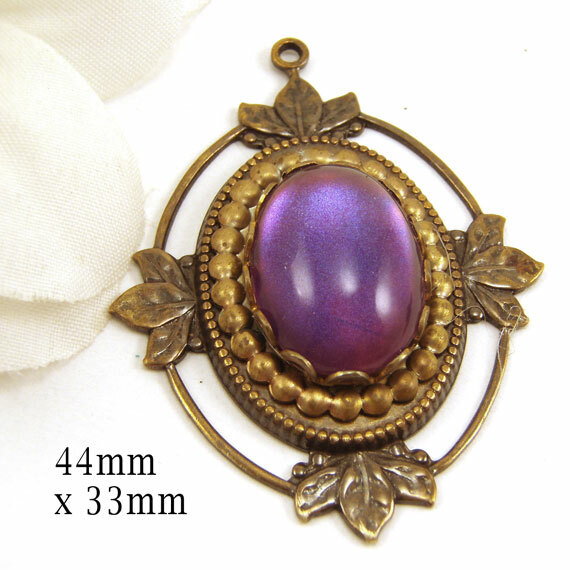 It’s just funny, ths little differences in colors – even with jewels from the same vendor and with the same name. 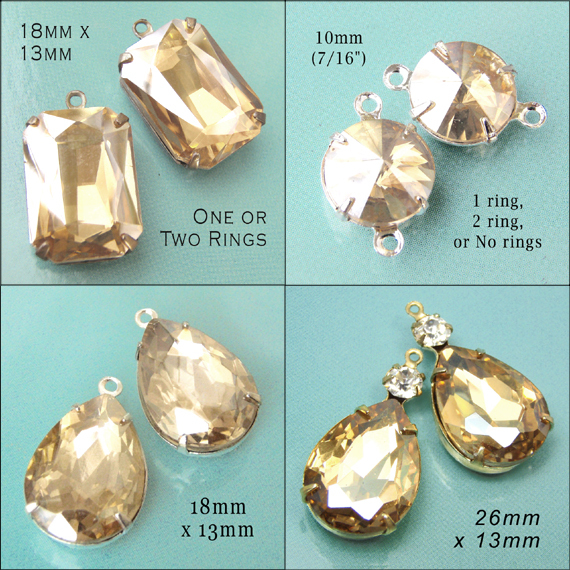 Look at these pretty Light Colorado Topaz glass jewels, all in my Etsy shop right now. You can see that they’re all the “same color”. But there are definitely differences, in light or dark-ness, in color intensity, sometimes beige-r, sometimes almost gold…. it’s just one of the little quirks of the jewelry trade. 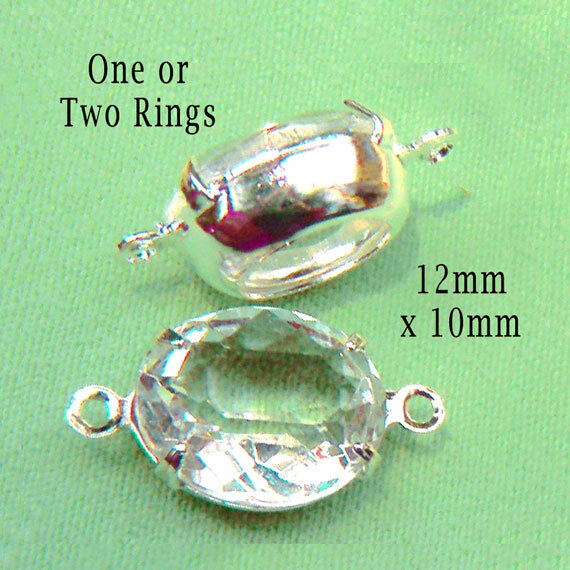 These are about 3/4″ x 1/2″ – large enough to stand on their own, as a pretty necklace or bracelet focal. They’re available with two ring settings as shown, and they they make a fabulous bracelet if you link several together and add a clasp. But you can also get them with just one ring at the top. Voila: instant gorgeous attention-getting necklace. Love it. Easy, vivid, striking. And hey, affordable. This is do-able! Vintage patina brass filigrees are a wonderful complement to vintage glass jewels (hey, they’re good with shiny new ones, too). Brass can be so timeless! The examples I show here are a few items in my shop right now. 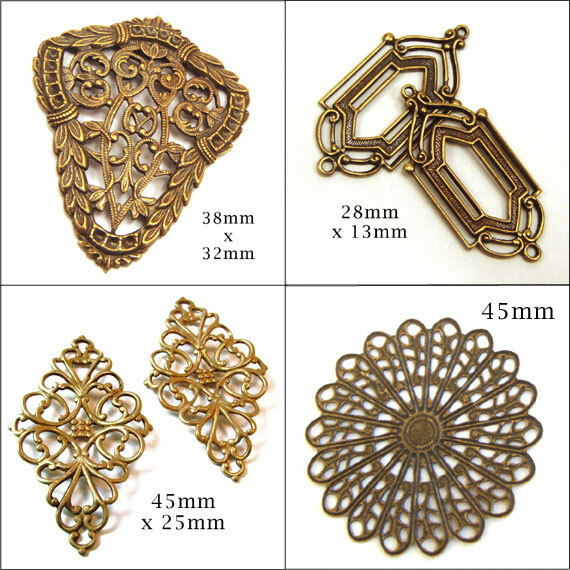 They’re actually new brass – but the die (or pattern) from which each is made, comes from mid 20th century – or earlier. I love the intricacy and detailing of these pieces. They are all made in the USA – from manufacturers that have dominated the brass jewelry trade for decades. They are, let’s put it this way, the Rolls Royce of brass filigrees. Okay, I’m biased. I’ve found some wonderful manufacturers. They truly are quality though. Imagine any of these pieces, with handwired teardrops or pearls. Or used as the connector in a fab bracelet. Or, well, you can imagine. Vintage shop. Vintage fashion. And Wow. I am in love. I was wandering through Etsy, looking at vintage goodies, so I could start the new year finding some wonderful vintage. And I have done that. Now, first, that’s a great dress. It could go from day to night, work to party, and it’s a flattering color and style. Also warm, which right now? Major plus. And are you ready for this? $52.00. For a dress that will take you anywhere. But there is More. Yes, this is a fabulously great dress and I would be proud to own it. But the even better-ness? Is the SHOP. I found this treasure at Dina Louise on Etsy. Now seriously, you need to listen to me. This woman has the Eye. She knows quality. She knows how to find it and stage it. And she tells you about the flaws! When I read her About page I understood why. She’s got creds. Including a writeup on Vogue’s Best Dressed List for vintage boutique back in her brick-and-mortar days. She’s got a great shop. You need to visit and bookmark it, and then return many times to find treasures. You will love me for telling you this. Happy new year – let’s have a good one! I hope your New Year’s is starting out well! We had a lovely time last night (stayed home with friends instead of fighting drunken traffic) – and I’m tucked in away from the cold. But the pendant? is just a beauty! I’m keeping one for myself, on a simple golden chain, a little longer than usual (about 26″). Talk about a gorgeous St. Paddy’s necklace! oh, I don’t know if it’s appropriate. I do know it’s flattering and looks great!